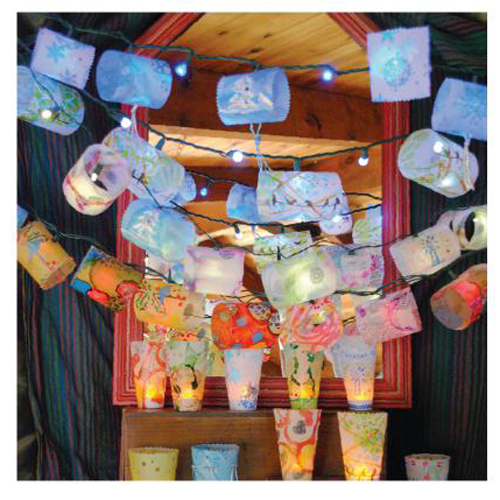 Project Description: Make your own lanterns form votives and string lights with Grafix products. One sheet makes 4 barrel lanterns for string lights or 2 small cone shades for the battery LED votives. If I’m making a whole set of string lights, I layout about 6 sheets of the matte film side by side on my work table; 6 sheets will make 24 barrel lanterns for string lights, or 12 cone shades for battery votives. 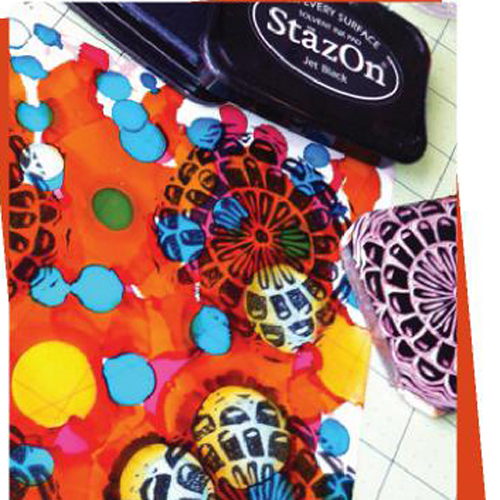 Using both store bought and homemade stencils, I layered stenciled patterns of color. 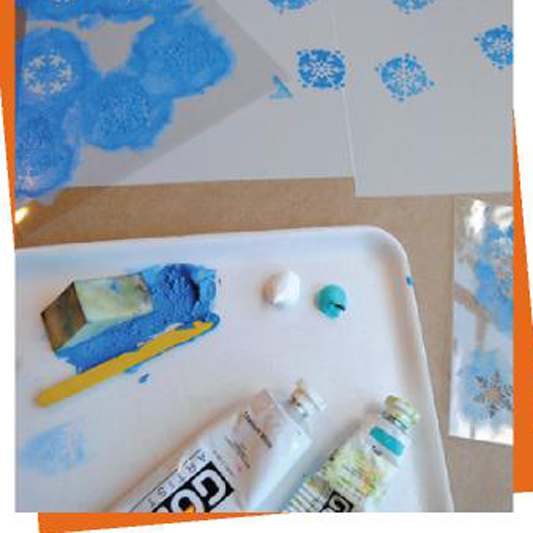 The acrylic dries fast so you can put down one layer of stenciled color and move on to the next almost immediately. Make sure to leave plenty of white space since the acrylic paint is not transparent, so light won’t shine through. For this technique, simply color the matte sheets completely with permanent marker. Don’t worry about any pattern or design, just scribble the color on. Be sure not to use very dark colors or colors that are opposites on the color wheel, as they will blend and make a brownish-grayish color. I choose tertiary colors like magenta, violet and blue, or green, yellow and turquoise. Once you have the sheets completely scrib¬bled, with an eyedropper or brush, drip rubbing alcohol on the surface and watch the colors move and blend. It dries very quickly and you will find a beautiful subtle marble effect on the surface that is permanent when dry. I then stamped mine with store and self-made stamps using black permanent ink to add accents and interest. The alcohol inks give the brightest, most transparent color of all the techniques. The alcohol inks can be put on the surface in an infinite number of ways, but to make this wonderful marbled paper look, I simply dropped the inks in onto the surface, being mindful of how colors will blend. Then I dripped and splattered rubbing alcohol to create pale rings in the bright colors already on the surface. Again, this dries quickly and accents in black can be added using self-made or store bought stamps and permanent ink. Alternately, you can brush the ink onto the surface, then drip rubbing alcohol on it to give a paler, lighter effect. I also found you can brush the alcohol ink onto large stamps and stamp them on the film – the edges bleed a bit, and it looks great with colors and patterns overlapping. After paints or inks are dry, cut your film into four 3″ x 9″ strips. Then on each end, 1/4″ in from the edge and centered at the 1-1/2″ on the short ends, cut three 1/4–1/2″ lines to make * (See Pattern on next page). Then create a barrel, lining up your * on each end. To attach, you can simply use regular household scotch tape that typically comes in a matte finish and is barely visible when used on the matte film. Or if you have eyelets and an eyelet crimper, then you can place four eyelets to hold your bar¬rel in place. Then you simply slip the light through the * and your first lantern is on. I made a simple fan pattern that makes two cone shades from one sheet of the matte film. Cut the fan, then tape or attach two eyelets on either end to create your cone, then simply slip over the battery votive base.